Feng shui Fu Dogs, or Imperial Guardian Lions, are a strong feng shui protection symbol. Fu Dogs were traditionally placed in front of Imperial palaces, temples, and government offices. They were also a traditional feng shui symbol of family wealth and social status and were placed in front of wealthy homes. Fu Dogs are usually displayed as a couple. The male Fu Dog is holding a globe under his right paw, which signifies control over his domain and protection of his home. The female Fu Dog is holding a cub under her left paw, signifying strong maternal protective instincts. It is interesting to note that the lion is not an animal indigenous to China. It is believed that travelers to China brought stories about lions as Buddhist protectors of Dharma. Statues of lions were modeled in feng shui based on the travelers' descriptions and drawing inspiration from native dogs. Today, there are Fu Dog feng shui cures to suit any taste and any home. The color, size, and material can influence where and how to use a Fu Dog—from guarding a front door to adding a sense of calm and good luck to your home's interior. A metal Fu Dog couple is good for a front door direction that calls for the Metal feng shui element, such as a northwest- or west-, or north-facing front door (the Water feng shui element benefits from metal's energy.) The male Fu Dog (the one holding the globe) is always placed on the male, or Dragon side of the house (to the right of the main door). The female Fu Dog (with the cub) is placed on the female, or Tiger side of the house (to the left of the main door.) You determine the right and left sides of the house by facing your main door from outside the house. 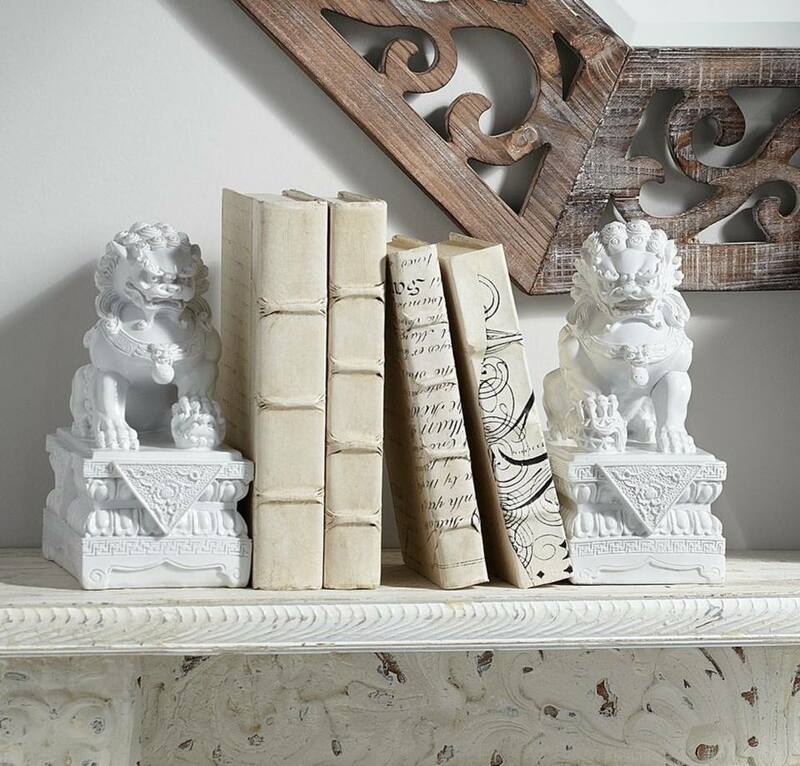 Ceramic Fu Dogs in soft white color can be an excellent feng shui decor addition to an Asian-inspired space. White Fu Dogs tend to have a graceful energy and can work with most home decor. Multi-color Fu Dogs bring the feng shui energy of playfulness and celebration. A multi-color Fu Dog couple is excellent for a west-facing or south-facing front door. The energy of the green jade adds to the powerful protection energy of this feng shui symbol. This is a great choice for an east-, south-, or southeast-facing main door. Porcelain Fu Dogs in blue bring a feng shui sense of calm. Suitable for inside, you can use them in almost any area of the bagua that needs an extra energy boost of protection. No matter which feng shui area of the bagua you choose to place these Fu Dogs, have them face toward the main door, or the outside of the house, not the inside. A tassle offers an alternative feng shui use of the Fu Dogs symbol. It is best to display a Fu Dogs tassel close to the home's main door. A mystic knot feng shui design in a tassel adds to its protective and good luck energy, as does the auspicious feng shui power of the color red. Do not display a Fu Dogs tassel in the bathroom or​ kitchen.